This spectacular home was built by homeowner, with attention to detail and craftsmanship throughout. The focal point, as you enter the home is the wall of windows that leads to the expansive deck. The fieldstone fireplace with every stone hand picked, covers the wall that you see next. The oak wood flooring was milled, from trees the owner cut down themselves. The entire main floor is handicap accessible, in order to accommodate generations of family. 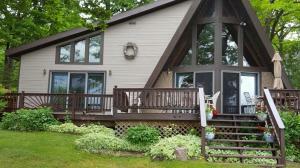 This four bedroom, three bath home is well thought out and takes advantage of the beautiful views of Mullett Lake. Being at the tip of the point, it feels like a private paradise. Most furnishings are included. This home has been rented for $3000 per week, and accommodates 12-15 people easily. Schedule your private showing today.